On Monday, January 7, 1991, I wrote these words in my journal: “Maybe the emotional roller coaster ride is over for a little while anyway. The foreseeable future looks ‘normal’ as far as I can see.” (To see part one of this post, click here) Little did I know the ride was just beginning! About one week after I wrote that entry everything in our little mission’s mother church began to unravel. The United States went to war in Iraq on January 16, but it seemed in my soul that the biggest war was in our mother church, and I was drug into it. The situation got ugly at times, and though I usually wasn’t in on the ugly meetings, I was lied to and lied about on some occasions, even by those considered to be spiritual leaders. Looking back, it is easy to see how people believed what they did. It was certainly unintentional lies, like bad assumptions or rumors thought to be true, but it hurt nonetheless. I probably didn’t know the entire truth either, and I’m sure I also spoke more than I should have. The director of the college ministry we eventually became a part of gave a talk about that time on patience. Two points he made had quite an impression on me, and I also recorded those in my journal. First, he said, patience is not a blind resignation to circumstances but a quiet confidence in him who controls those circumstances. And, two, the best thing God can give us is not changed circumstances but a better relationship with him. In spite of the pain, God was especially close in those days. I was reading through First Samuel at the time, and many of my notes reflect encouragement from David’s waiting in confidence and trust for God to open the right doors. Though those first five months of 1991 seemed like a desert in terms of ministry; God was working in our lives, conforming us to him, teaching us his will, and bringing about his desired ends in ministry. That was one of the most formative times in my life. And looking back, we see the incredible faithfulness of God. Such a reminder has been needed in recent days. God is faithful; God knows the end from the beginning; God is in control! In his amazing grace God has an amazing way to use sins against us, and even our own sins, to bring us where he desires in character, place and ministry. “The LORD will keep your going out and your coming in from this time forth and forevermore.” Amen. This morning I read Psalm 121 in my devotions. It was appropriate because Cathy and I have been talking about how God watched over our lives through a particularly trying time of ministry and emotions in 1991. The encouragement is that God is watching over our lives during the trying time we are in now as well. This hasn’t yet been as trying as that period was. Here is the text of Psalm 121 followed by the first installment of the story about that year. It had been over a year since Cathy and I discovered we couldn’t have children, and we had been jumping through the hoops of the adoption process ever since. Probably in November of 1990 we heard about an adoption situation through the Cheyenne Crisis Pregnancy Center that we would pursue. There were many emotional ups and downs before we learned that the mother had chosen another family. The emotions settled, and life seemed to return to normal, until the middle of December arrived. The first bump in the road was the death of my aunt. Though not particularly shaking for me, it was the second of my mother’s siblings to die that year and was hard on everybody in the extended family. We went to Fort Collins, Colorado so I could be a pallbearer in the funeral. The day after the funeral, I had a temperature of 101°F. I was down with the flu for three days, including a Sunday where I missed preaching – still the only time I’ve missed a Sunday in my 26 years of ministry. In our little mission church, in a rural area, there wasn’t another preaching option, so Cathy led some songs and a prayer time, and everybody went home. About the time I started feeling better, the extreme cold weather hit. As I recall, it was below zero Fahrenheit for a week straight with lows colder than 20 below for many days. This was extreme, even by Laramie, Wyoming standards. We had to take our batteries into the house every night so the cars, especially the old truck, would start the next day, but even then it took some work and special attention to get them going in that weather. We lived in a rural setting and getting to town, a normal 40 minute trek was taking an hour and a half. I was to perform a wedding in Laramie on December 21st, so the rehearsal was on the 20th, a day when the high temperature was about 20 below zero. The rehearsal was fine, but the next morning our thermometer read -47°F! 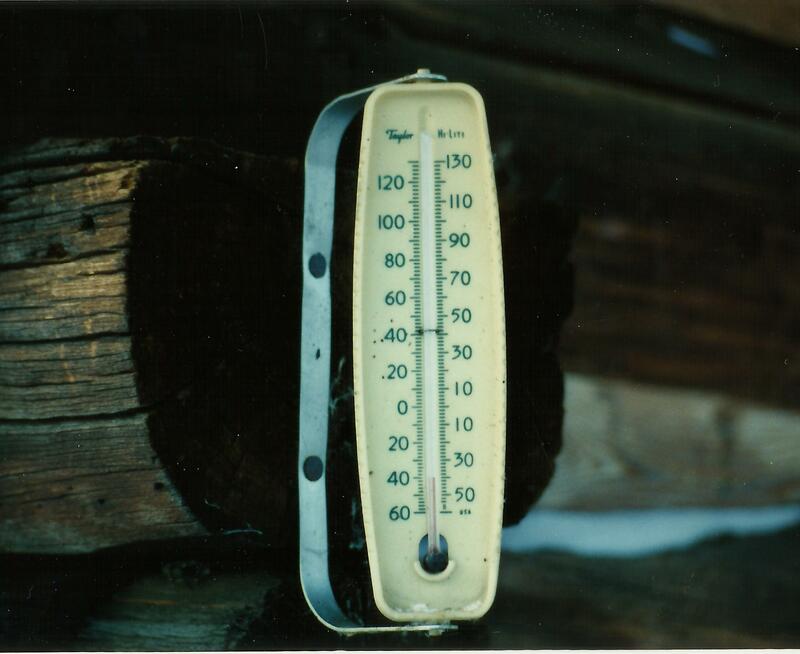 (We took a picture of the thermometer which was already catching the morning sun!) We told the groom we knew he wasn’t going to marry until hell froze over –which appeared to have happened over night! While getting ready for the ceremony, the door of the church fell off its hinges, so we worked that old, and already stressed, furnace way too much. In that environment, it’s no wonder that one of the bridesmaids passed out during the ceremony! That evening, we picked up my two nephews to spend the Christmas holiday at our mountain home, where a white Christmas was almost always guaranteed. The boys’ parents were to join them in a few days. We really had to bundle them up for the cold ride in the old truck. But we got home fine, company came, and, even though we had to do everything indoors, Christmas went off without a hitch, and the weather began to warm up. But that’s when things got really crazy. The next week is just a blur in my mind, but, according to some old journal notes, here is what happened. My best friend’s younger sister passed away from a genetic disease. We received the news the night we arrived home from the cold wedding with two frozen kids in tow. On Thursday, December 27, we drove to Cheyenne for our second funeral in two weeks. It was particularly hard, because their brother had died from the same disease just a few months prior. We arrived home that night to learn that the adoption situation had changed dramatically, and we were now to be adoptive parents. On Friday we again drove to Cheyenne to meet with the CPC counselor, the birth mother and the lawyer. The child was to be delivered by C-section on Sunday. After preaching two services, because I was also filling the pulpit in our mission’s mother church that day, we drove to Cheyenne, a third time in four days, where the mother placed a little boy in our arms and announced that he was our baby and we should raise him well. However, on Monday we received word, from the lawyer, that the birth mother was refusing to sign the papers; she had decided to keep the baby. That was a tough blow. Since we were in Cheyenne, we went to my best friend’s daughters’ birthday celebration. After all they’d been through, that family needed a reason to celebrate something positive, and so we joined them in the party. The next day was New Year’s Day, 1991, and we returned to Cheyenne because the New Year’s party was at my sister’s house and because the next day, Wednesday, January 2, my mom was scheduled to have surgery. She checked in early and had all the preoperational tests and medications, some of which made her sick, only to discover that the hospital had so many dire emergencies that her surgery was postponed. We were all in the hospital, waiting from early morning until late afternoon, and then she was released. On Friday, she was in the hospital again, and this time the operation went as planned. We made our fifth trip in nine days over that familiar road. We got home that night to a message that the pastor of our mother church had cut his wrist, was in the hospital, and unable to preach on Sunday, so I was requested to fill in. It turns out he was fine and just needed time to heal, but that brought us half way to Cheyenne anyway, so that afternoon we drove over to check on my mom. Everything turned out fine for her as well. I didn’t get done preparing my sermon for that Sunday (surprise! ), so I told the story of our last ten days of life, with a reminder from Psalm 46 that God is our refuge and strength, even if the earth seems to give way. I was preaching to myself! On Monday, January 7, I wrote these words in my journal: “Maybe the emotional roller coaster ride is over for a little while anyway. The foreseeable future looks ‘normal’ as far as I can see.” Little did I know it was just beginning! But that has to wait for the second installment of this post, which is now available here.